Produce larger and meatier tomatoes up to three weeks earlier with Bonide Tomato and Blossom Set Spray. When used as directed, this ready to spray, plant hormone product provides biological grow power to promote flowering, increase blossom set, and increase fruit development and yield. In addition to tomatoes, this spray will also encourage beans, cucumbers, eggplant, melons, okra, peppers, strawberries, and grapes to bear fruit earlier. 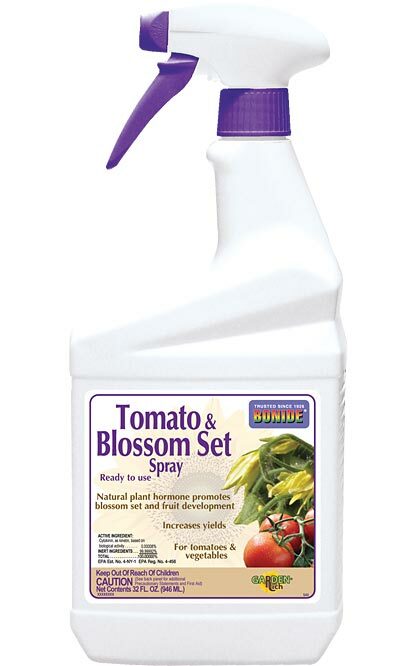 Speed up your harvest and increase your yields on tomatoes and vegetables with Bonide Tomato and Blossom Set Spray. Bottle Size: 32 fl oz.